The objective of this article is to demystify chatbot jargon, dispel myths, explore use cases, understand the ROI and ascertain whether chatbots are meant for you or not. A chatbot is an automated system or a robot that imitates human conversations through voice commands, text chats or both. Theoretically, chatbots are meant to emulate the experience of interacting with a human. The creation of this experience has given rise to a new UX paradigm called the Conversational User Interface or CUI. While chatbots gained hype in 2017, they aren’t slowing down and are now bigger than ever. So let’s take it from the top and deep dive into them. 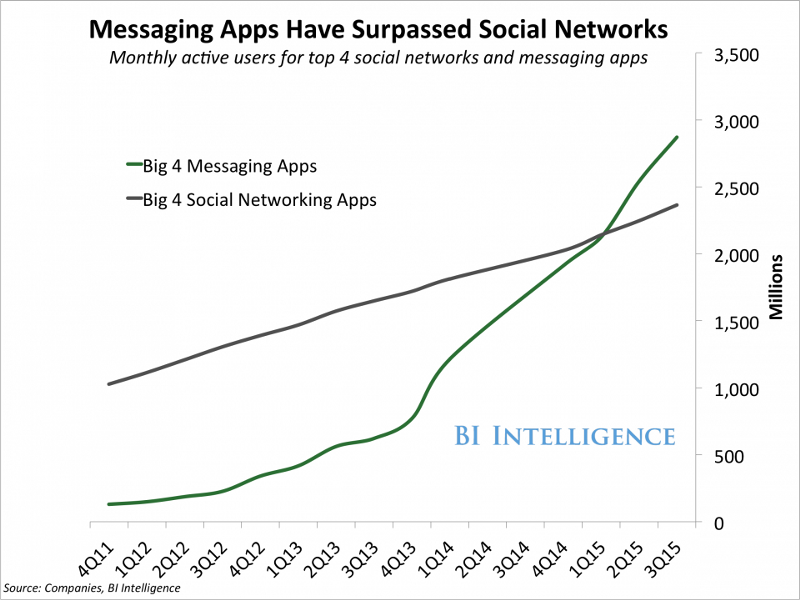 Chatbots are using the expansion of messaging apps as a lever. People are chatting more than ever. So if you were to open a store, would you open it on a street that no one visited or in the most popular mall in the neighbourhood? Another important factor at play is App fatigue. People now have fewer apps than they had earlier and would love to have only a couple of apps to cater to all their needs. This is also the reason a business like Amazon that has a vast bouquet of products sees more retention than single category serving apps. It’s going to go the same way for businesses. 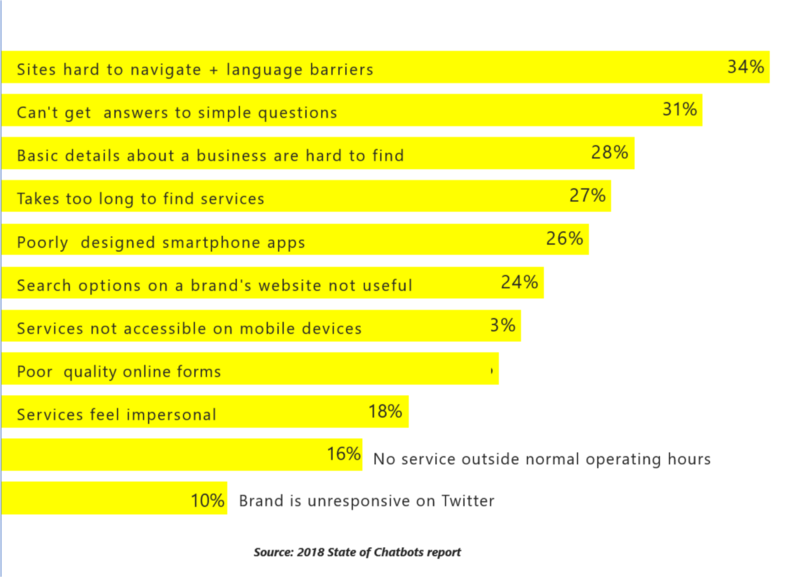 Given the opportunity, a brand would want to make itself available within applications that users use the most. If a brand can serve most of its customers through Facebook Messenger or Google Assistant or Whatsapp, would they actually want to spend on acquiring users on their own apps? So logically speaking, you now have the arsenal to build a business inside messenger apps where people are already present. And these messenger apps provide us with a new runtime for customer acquisition. Let me show you some benefits businesses have achieved using the ORI chatbot platform. Chatbots have gathered pace due to certain problems posed by websites and apps. Chatbots present an opportunity to tackle these problems. On the other hand, there have been areas where chatbots have delivered exemplary performance and see a lot of new applications in. Chatbots can be classified basis how they function, the technology at play and the function they serve. While some use cases could make do with a very simple chatbot (more like a point and click website within a chat container), most use cases require a higher degree of sophistication. Enterprise Chatbots are purpose-driven to enable self-care for consumers. This could include answering queries before a purchase (eg: 1. Which phone should I buy? 2. Which payment plan is better? 3. Which is a TV suitable for me? ); answering queries during ownership (eg: 1. I want to pay my bill 2. I want to know my health insurance plan 3. I want to troubleshoot my device) etc. Enterprise chatbots are deployed by large and small organisations in the business of servicing customers. 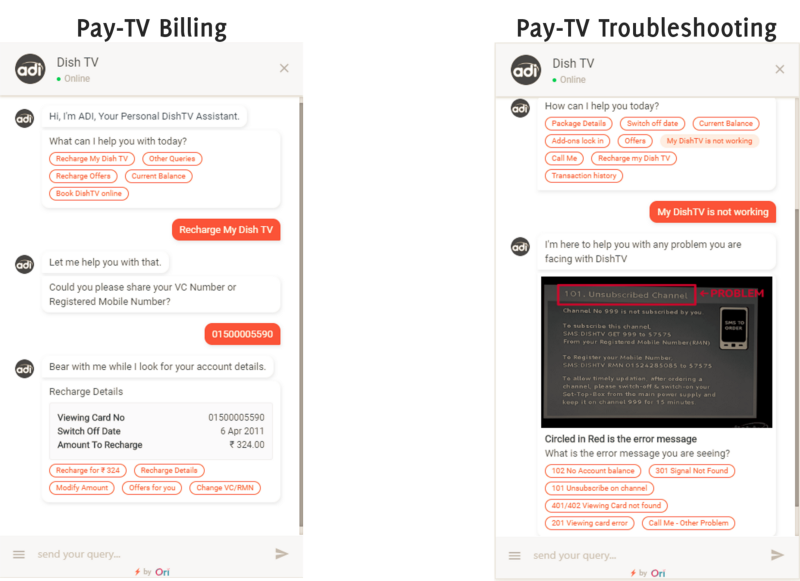 Typical businesses incorporating enterprise chatbots would be Banks, Financial Service Institutions, Insurance Companies, Telecom and PayTV companies, Retail, Services etc. Such chatbots require backend work including strategies for the implementation, target users, system integrations and well-planned execution. Messaging applications have turned into the best destination for brands to achieve target shoppers; it isn’t unexpected as to why chatbots have turned out to be so prevalent. By implementing a chatbot into your promoting technique, you’ll have the capacity to your audience, tailor your showcasing endeavours, reach new consumers and monetize your social media profiles. These chatbots are built to attract people and get them acquainted with a brand. The core focus of such bots is engagement. While these bots are applicable to all industries that work with customers you’ll mostly see Marketing Chatbots used to drive content. Zootopia has become one of 2016’s most popular Disney movies, and a big part of its popularity has to do with its spunky protagonist, Judy Hopps. 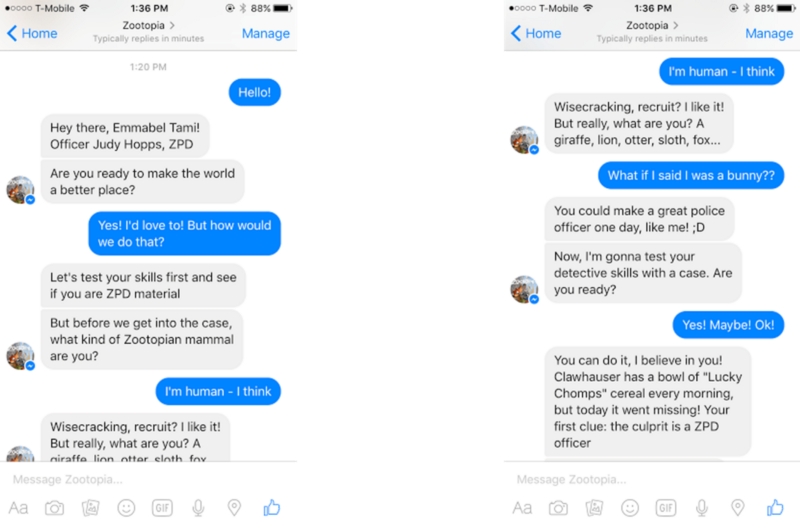 Disney Created a Judy Hopps bot where people could go and solve cases to earn a badge. Marketing chatbots can be used to push offers, engage customers with trivia and storylines as well as keep people posted on what’s happening with their favourite brand. We can understand this as a chatbot that works as a decision tree (virtual file hierarchy) system with a chat-based user interface with not much artificial intelligence or machine learning involved in it. Giving the user a group of buttons toward the start of the discussion sets a tone that they ought to abstain from composing a special inquiry and rather explore through a question hierarchy. While a few clients may, truth be told, prefer this technique, the perfect utilize instance of the chatbot is being torn apart. Dissimilar to menu-based chatbots, keyword acknowledgement based chatbots can tune in to what user type and react properly, or possibly attempt to. These chatbots use adaptable keywords and AI to decide how to serve a fitting reaction to the user. For example, (see the image below, the first iPhone convo) if a user asked to ‘Find a store?’, the bot would likely use the keywords ‘find’, ‘store’, to best determine which answer to respond with. So now an auto-generated message is sent asking to enter the zip code, address or location. Because that will now be the keywords to make a further search for the user, so the user types ‘New York’. To which bot finds the results instantaneously. Contextual chatbots are by a long shot the most progressive of the three bots talked about in this post. These chatbots use Machine Learning (ML) and Artificial Intelligence (AI) to recall discussions with the particular user to learn and develop after some time. Not at all like keyword recognition based chatbots, contextual chatbots are savvy enough to self-enhance in light of what clients are requesting and how they are asking it. One of the key reasons for the explosion of chatbots is the interest being shown by major platforms globally. Google, Microsoft, Facebook and Whatsapp are opening up their platforms for businesses to interact with their customers via chatbots. This means that by using an omnichannel chatbot platform (Text + Voice capable) like ORI, companies can now build one chatbot and deploy it on multiple channels. Thereby, achieving economies of scale through distribution. Chatbots help create the perfect feedback loop in the entire acquisition and retention cycle of customers. If you have a dedicated team technically proficient in development, then you can build a chatbot of your won. The obvious drawbacks here are the dedicated resources required for upkeep, cost and the time needed to build, a deviation from the core focus of business goals and ongoing maintenance. This option often involves access to a SaaS product to build your chatbot. Such platforms have the requisite libraries, integration plugs, visual builders needed to deploy a chatbot. The advantage is that it requires a minimum contribution of resources from the business with the chatbot vendor doing most of the legwork and taking complete responsibility of achieving business goals through the chatbot. This has got to do with the scope of the chatbot and the needs it fulfils. You could build a chatbot for lead generation, generating new sales and answering commonly posed questions. Further use include up-selling, cross-selling, account management, customer support, troubleshooting, information dissemination, and so on. 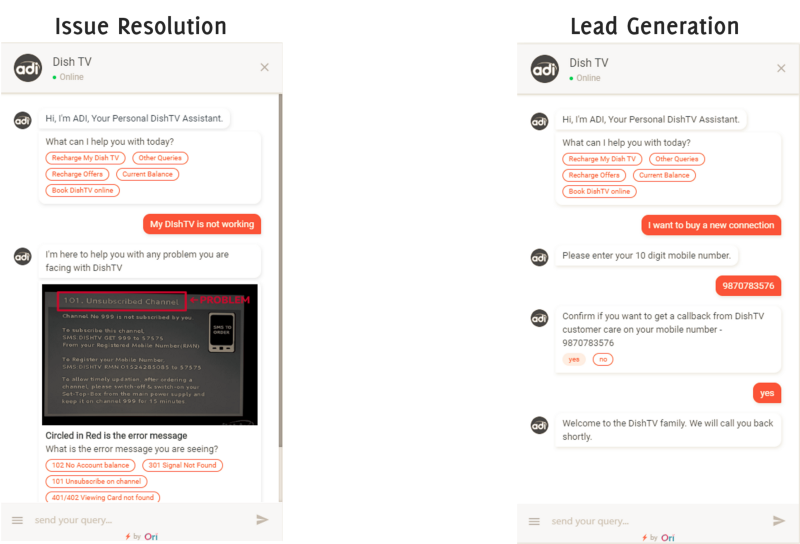 Gaurav Goel, President of Strategy for India based DishTV (Asia’s largest Pay-TV provider) wanted a chatbot t0 to manage customer expectations across the service lifecycle. He added, “There are various bot building frameworks. We took 2 months to assess over 40 of them. Some work only on Facebook Messenger, while some work only on your website, which is fine if that’s your only future channel,” he said. Gaurav wanted a provider that could integrate with their systems and deploy a chatbot on multiple channels with multilingual capabilities, to cater to their diverse user base. to expand the outreach and usability of his chatbot. Chatbots will be seeing a lot of innovative applications as Machine Learning and AI continue to make quick advancements. This will be further supported by a thriving developer community and open source technologies. A survey by Oracle included responses from 800 decision-makers including chief marketing officers, chief strategy officers, senior marketers, and senior sales executives from France, the Netherlands, South Africa, and the UK. 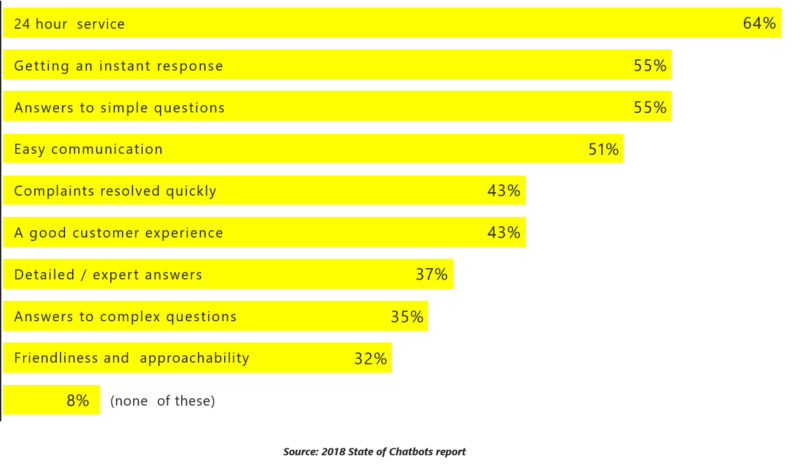 When asked which emerging technologies they are already using and which they intended to implement, 80% of respondents said they already used or planned to use chatbots by 2020. Chatbots are interactive software platforms that reside in apps, live chat, email, and SMS and can behave in a human-like manner.